It’s been great to visit classrooms and join students as they engage in their learning these past few weeks. Our fourth grade art students worked with our art teacher, Ms. Discenza, to write compelling, persuasive messages with the hope to create an outdoor art installation this winter and why a project like this would benefit our school community. The students have been learning about “yarn bombing”, which is the practice of weaving, crocheting, knitting, or wrapping yarn around things like benches, lamp posts, and trees. They have begun this creative work across the front of our school these past few weeks. I encourage you to take a close look at our fourth graders colorful creations. It was great to see several of you at our Principal Coffee this past Monday, January 28. I really enjoyed presenting about our new special education staff, the aforementioned grade four “yarn bombing” project, the recent work of our Responsive Schools Team, the Kaleidoscope Bags (a home based activity for families) put together by our Families Organizing for Racial Justice (FORJ), our upcoming All School Dr. King Assembly, as well as some more valuable ways our PTO and all of you are helping to bring some meaningful tools to our school community. If you were unable to attend you can view my presentation by clicking here. This Wednesday, January 30 our entire school community was treated to an incredible Winter Concert, which included performances from our fifth grade band, our string orchestra, and our fifth grade chorus. The fifth graders performed in front of the school in the morning and in the evening for their families. Thank you to our fifth grade band directors, Ms. McIntosh and Mr. Sheppard, our string orchestra director, Ms. Bergantino, our fifth grade chorus director, Ms. McIntosh, our accompanist, Mrs. Ross, all of our fifth grade students, as well as a few from other grades for all of your hard work and dedication to putting on a spectacular show. This Friday, February 1, I am looking forward to seeing the excitement that students have for the upcoming Super Bowl as they dress in Patriots gear, as well as other sports gear in support of their favorite team. I know many of us are looking forward to enjoying the big game this Sunday, February 3. The last full week of January has been a busy, if not a freezing one! On Monday, Mr. Bultema hosted a Principal Coffee and introduced members of the Mason-Rice Special Education staff as part of the morning presentation. We thank all the parents who attended and especially thank Principal Bultema and his staff for an informative morning. Please click here to view the presentation slides. On Wednesday, the 5th Grade Chorus, Orchestra, and Band performed their annual Winter Concert for families, friends and fans alike. Thank you to all our 5th Graders for their hard work and wonderful performances, and thank you to the teachers and staff who made the concert such a success. Thank you to all the generous donors that provided items in the auction, and thank you to all the bidders for making this year’s auction another exciting success! There were so many great items to purchase. Preliminary numbers indicate we exceeded our budget goal! We raised over 39k (last year was 36K) and 278 bidders participated! In past years exceeding our goal has allowed us to do things such as reserve money for current and future technology needs in the classroom. Thanks to all of the hard work of the army of volunteers including Danielle Boudreau, Emily Coes, Sally Dupere, Karen Flood, Yasmeen Kazimi, Justine Kelley, Marcia Neiberg, Lucy Mermagen, Maureen Oates, Molly Perencevich, Erica Rai, Gina Rhee, Patrick Song, Leslie Ziarko Valera, Jenna Wang, and Joelle Zakak. Be on the look out for an email from the auction team with some last chance deals on unsold items and parent events that are still have spots available! We want to especially thank our tireless auction committee heads Liza Harris, Meredith Tzouros and Carol Ann Delmonico who began working on the auction months before it opened and spent countess hours and many late nights ensuring our auction is such a huge success. We also want to give a VERY VERY special thank you to Carol Ann, who has co-chaired and helped with the auction for many years and who’s youngest child will graduate from M-R in June. Whether in her role as a committee chair, a PTO co-President, co-Treasurer or her endless support in all things Mason-Rice, Carol Ann’s contributions to our community are profoundly appreciated. Thank you! Family Fitness Peek Week is coming March 18-22! A parent and child favorite, this is an opportunity to visit your child’s P.E. classes and take part in the experience. Please see below for more details. ONGOING: Friday Morning Drop-In at Central Cafe and Restaurant (761 Beacon) starting at 8:30am during the winter months. LUNCH BUNCH: HOUSE OF TANDOOR – TODAY! 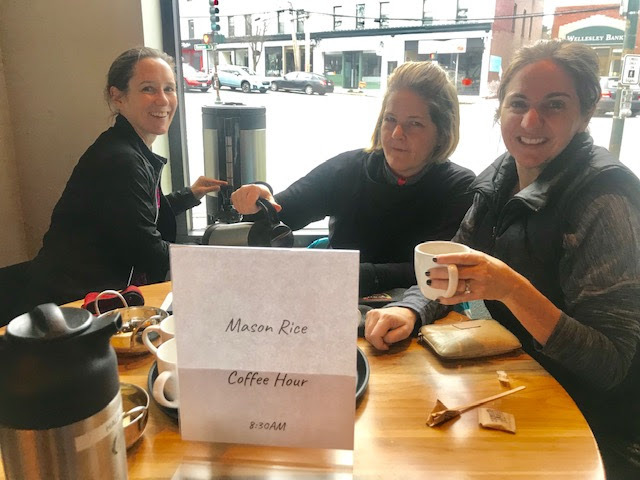 It’s the first Mason Rice parent lunch meet up of 2019! Let’s gather at House of Tandoor at noon on February 1. RSVP here! Please join us every Friday morning starting at 8:30am at Central Cafe and Restaurant (761 Beacon) to catch up with old friends and meet new parents! Look for the “Mason Rice Coffee Hour” sign! Hope to see you there! The bus counts too! Please join us in supporting the growth of our community. If you must drive, please consider parking a block or two from the school to walk part of the way and help reduce traffic congestion. For those who participate, we will have wintery surprises to hand out. We have a few slots left for our volunteer shift at Cradles to Crayons (C2C) on Saturday, February 9 from 10am – 12pm. (Arrive at 9:45am)! All children ages 5+ are welcome to volunteer. Please sign up here. If your plans change, update the sign-up so other families can join us. If the sign up is full and you’d like to be added to a waitlist, please email Marci Shyavitz. We have already collected 9 large bags of donations and let’s keep them coming! The C2C shelves are bare in January so it’s a great time to go through your closets, attic, basement, and/or garage to find new or like-new children’s items to donate. Then put your toy, shoe and clothing donations in the C2C Blue Bin in the M-R lobby by 2/8 or if you are volunteering, bring them with you to C2C on 2/9. You can learn more about their most needed items here. If you have any questions, please email Marci Shyavitz. Thanks! February is American Heart Month. Children will be encouraged to decorate a heart and write something they do to stay healthy, such as walked to school, ate a healthy breakfast, tried a new vegetable, played basketball, danced with friends, ice skated, etc….Our teachers will distribute hearts in the week of Feb 11-15 and we will post the finished hearts in the gym. The kids can do their art works at school or take the hearts home to finish (before Feb 15). We are now at capacity for both Dinner Hosts and Attendees for this year’s Mystery Dinner. Thank you to all who signed up. We are looking forward to a fun evening! Contact Jess Poscover or Liz Bouvier if you have any questions. Calling all creative and comical minds wanted for brainstorming skit ideas for Fool’s Folly!!! Please join us Tuesday, February 12 at 7:30 for Fool’s Folly planning at the Camargo residence: 38 Morseland Avenue. This will be a fun night to discuss ideas for Fool’s Folly. All are welcome to join including teachers, Mason-Rice staff and of course Mason-Rice parents. Fool’s Folly is an entertaining night celebrating the parent-teacher community at Mason-Rice by showcasing hilarious skits created by parents and teachers that poke fun at the day-to-day nuances of being a parent or teacher. This is the last of our workshops for Understanding Our Differences in 5th grade. We will be talking about Intellectual Disabilities. We need volunteers from 11.30 am to 12.40 pm on February 15. If you have any questions, contact me under francoise.kohler@gmail.com. For signing up, please go to this link: https://www.signupgenius.com/go/20f0d49a8a82caafe3-intellectual Thank you! Save the date for our 5th Annual Mason-Rice Family Bingo Night on Friday, March 8! It will be held in the Centre from 6:00-7:30pm. Pizza and drinks will be available. A sign-up will follow in a few weeks! If you have any questions, please contact Marci Shyavitz. During this week, caregivers and parents are invited to come into the classroom and present on any topic related to Science, Technology, Engineering, the Arts or Mathematics. Signup will open soon. We encourage caregivers to create hands-on presentations and to coordinate with teachers to ensure that topics are age and classroom appropriate. Caregivers, we encourage you to begin thinking about the STEAM topic you’d like to present in your child’s classroom and please mark these dates in your diary. Contact STEAM week committee — Aedin Culhane and Sharon Topper — for more information. Please Save the Date for this year’s annual Speaker event, which will take place in the Centre on March 13 at 7 pm. We are lucky to be able to hear from Carla Naumberg, PhD, LICSW, a wonderful parent coach, writer and speaker. She is the author of three parenting books including the forthcoming “How To Stop Losing Your Sh*t With Your Kids.” Her writing has appeared in the New York Times, The Washington Post, The Huffington Post, and Mindful Magazine. She will speak to us about how to make parenting less stressful and more fun. You’re Invited!! Families and guardians of 3rd, 4th & 5th grade students, please save the date for our Family Fitness Peek Week during the week of March 18th-22nd. This is an opportunity to come to one or both of your child’s physical education, health & wellness classes during that week. You’ll be able to experience one of our fitness themed classes with your child. The student’s are working hard at learning about the various components of fitness, and participating in activities that target those areas. We look forward to seeing you there! More information will be coming home with your child after February break. In the meantime, if you have any questions please contact Beth Ann Nohmy at BethAnn_Nohmy@newton.k12.ma.us. NEWTON SOUTHEAST LITTLE LEAGUE SPRING 2019 REGISTRATION NOW OPEN! Registration for all divisions (T-ball through Majors) is now open for students who reside within or attend private or public schools within the public school district boundaries of Memorial-Spaulding, Mason-Rice, Bowen, Angier, Countryside and Zervas. Children who attend one of these schools but live out of district may participate in NSELL’s program under Little League’s 2019 rules without a waiver. Majors Registration Ends January 15th!!! We are offering a $30 early bird discount for T-ball for players registered before February 1, 2018. Newton Girls Softball Rec League is for girls in kindergarten to 7th grade. Supportive coaches teach the fundamentals of softball and develop confidence, determination, and resiliency. Team sports can play a great role helping girls face gender specific challenges as they get older. There is a place for girls of all ability levels in Softball, in a different way from soccer, basketball, and lacrosse. If your daughter is not playing a spring sport, even if you or she has not considered sports before, please look at our website: http://newtongirlssoftball.org/. Also, Rec League Director James Alandydy would be very happy to talk with you more about it. Please contact him at: james.alandydy@gmail.com. SIGN UP FOR NEWTON YOUTH LACROSSE! Sign ups for Newton Youth Lacrosse spring session for grades 1-8 are taking place through February 1. Register early to be guaranteed a spot by clicking this link or going to newtonyouthlacrosse.com. Questions about registration, coaching and volunteer opportunities can be directed to newtonlaxpresident@gmail.com. We are looking for an energetic, flexible, & organized individual to begin working with our family as soon as possible (5th and 9th grade kids). Job description is part babysitter, part tutor, part friend, part chauffeur, part camp-counselor, part chef and errand runner! Ideally we need someone M-F, but for the right person we will consider a 2, 3, or 4 day a week scenario. We need a commitment from 3 p.m. (12:30 on Tuesdays) until 6:30 p.m. Please contact Jessica Berns at jessbberns@gmail.com.